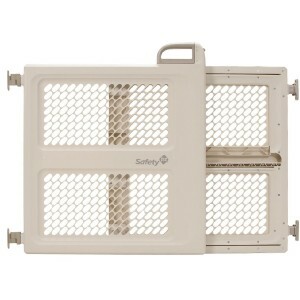 The Safety 1st Lift, Lock and Swing Gate is just what you need to keep your kid safe and secure. This sturdy and easy to use child proof gate is one of the best safety barriers that you can use the moment your kid starts to crawl or walk. Instead of having to worry all the time thinking how to prevent your child from falling down the stairs, or from reaching the kitchen, use a sturdy barrier, to keep your child safe and calm. This strong gate is extremely easy to install and re-install and the process does not require more than a few minutes of your time. It is made of plastic which makes it lightweight and slender, but is at the same time, durable and strong. It has a top pressure handle, which is possible to open with just one hand – a mechanism that is extremely handy when you have your arms full or if you happen to be carrying your child. This top handle eliminates any bending to open or lock the gate. It can be hardware mounted with hinges screwed in, as well as pressure mounted with built-in pressure pads. Two mounting options lets you choose between each other when you decide on the different areas of your home that you need to have it installed, i.e. a pressure-mounted option would be preferable if you want to change locations inside the house, whereas the hardware-mounted option would be preferable for vulnerable areas such as the top of the stairs where it can’t be easily knocked down. It measures 26 inches in height, and can be expanded between a range of 28 inches to 42 inches width. It is easy for an adult to open and close easily with just one hand, but impossible for a child to do so. With its two options of mounting i.e. between hardware mounting and pressure mounting – it can be used in any room, open space or area of the house, including the top and bottom of the stairs, doors and passageways, middle of the room or even between two furniture. It is high enough to keep out young children as well as pets, so it can be used even after your kids are grown up and you still have pets inside the house. The gate is also durable and long lasting and can be used for many years without any need to maintain or repair. Some complaints have arisen from existing customers that the option for pressure-mounting is not very sturdy and can be taken down by a bigger child or an adult by applying a little pressure. However, when using it in vulnerable and relatively dangerous places like the top of the stairs, or in balcony doorways, it is preferable that parents/guardians use the hardware-mounted option. The pressure mounted option is preferable in cases where the gate may be moved from one to another new location, or when it is not possible to drill. This gate has been rated 3.5 out of 5.00 stars by its existing customers and is available at an affordable price of $33.74 with an additional $10.70 for shipping. With its two mounting options, this gate is a great safety measure to have around the house once your baby starts to crawl and walk.